Gujarat state was created on 1 May 1960 out of the 17 northern districts of Bombay State when that was split on a linguistic basis (also creating Marathi speaking Maharashtra). They are as follow : Ahmedabad, Amreli, Banaskantha, Bharuch, Bhavnagar, Dang, Jamnagar, Junagadh, Kheda, Kachchh, Mehsana, Panchmahal, Rajkot, Sabarkantha, Surat, Surendranagar and Vadodara. In 1966 Valsad was split from Surat. Porbandar was split from Junagadh. In 2000 Patan District was formed from parts of Banaskantha and Mehsana. On 2 October 2007, Tapi was split from Surat, as the state's 26th district. Aravalli was split from Sabarkantha. Botad was created from parts of Ahmedabad and Bhavanagar districts. Chhota Udaipur was split from Vadodara District. Devbhoomi Dwarka was split from Jamnagar. Morbi was created from parts of Rajkot, Surendranagar and Jamnagar districts. Gir Somnath was split from Junagadh. 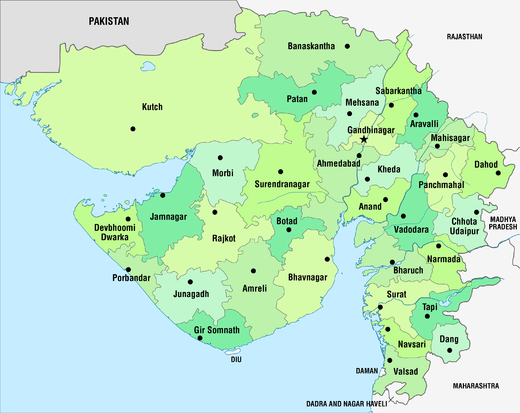 Wikimedia Commons has media related to Maps of Gujarat. ^ Dave, Kapil (7 October 2012). "Next Republic Day, Gujarat will be bigger..." The Indian Express. Retrieved 13 October 2012. ^ "State Govt Announces 23 New Talukas". HighBeam Research. 10 September 2013. Archived from the original on 6 February 2016. Retrieved 5 January 2016. ^ "Gujarat Govt made major announcement Dholera SIR at Dholera district". Dholera SIR. Government of India. Retrieved 6 January 2009. ^ a b "Ranking of Districts by Population Size, 2001 and 2011". 2011 census of India. Government of India. Retrieved 3 May 2012. This page was last edited on 25 March 2019, at 06:20 (UTC).